On Friday I was headed home after work and I called Sickie to see if he needed anything. I drove quickly because it was almost 6 and I didn’t know if the peach guy would close up shop or not. He was open, and I had 4 dollars, expecting to be able to buy a handful of fruit. 20 bucks!!! Grrrrr….. 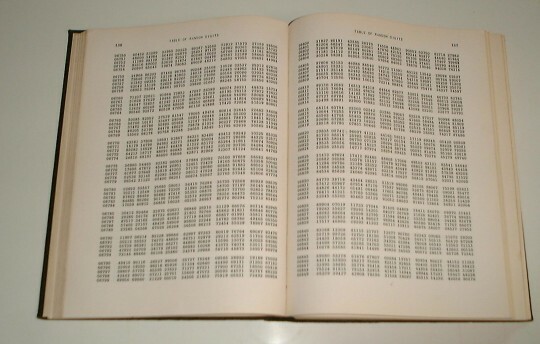 I broke into my emergency money and bought the box, grumbling the whole way home that I had just bought a box of work. Lloyd likes fruit, but he couldn’t eat all this before it went bad. Cut ’em all the way around criss-cross-like and dunk them in boiling water for as long as it takes you to whistly your ABC’s in a jaunty style. If you get tired of that one, try Twinkle Twinkle or Baa Baa Black Sheep. Take them out and the skin just slips right off. Then just smush ’em off the pit. Add some water, some sugar and a slug of lemon juice. Start cooking and start smashin’. Admit that you really don’t know what you’re doing. 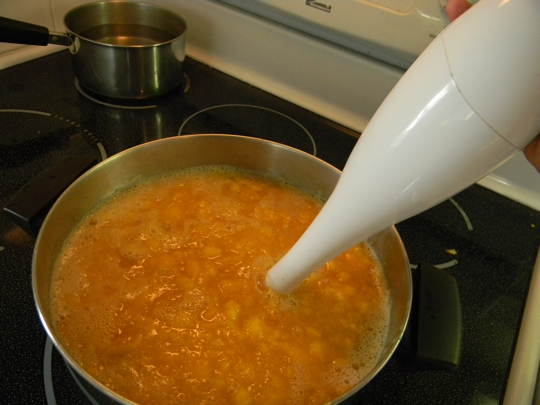 Get out the immersion blender. Sniff it to make sure it doesn’t smell like curried peas, since that’s all you ever use it for. 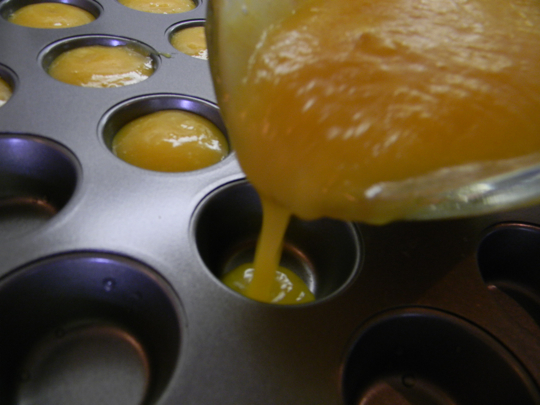 I poured five trays of fruit leather, three ice cube trays, then a mini-muffin tin for peach ice cubes. I figure these will be good to throw in a glass of orange juice. I had no idea he liked peach pie. So, I cut up some for a pie. This was even more fun than the first kind of cut. 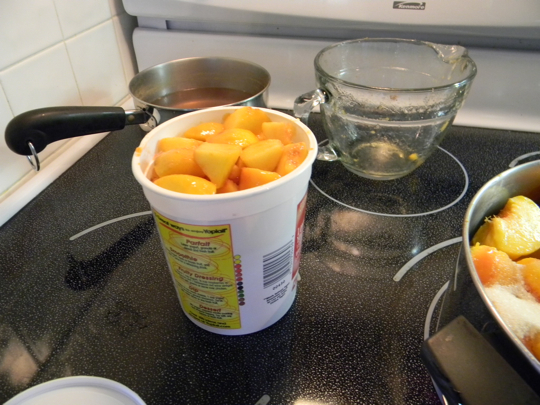 I cut each peach into eight wedges (four times around), dunked it in the boiling water, slipped off the peel, then cut it around the middle. 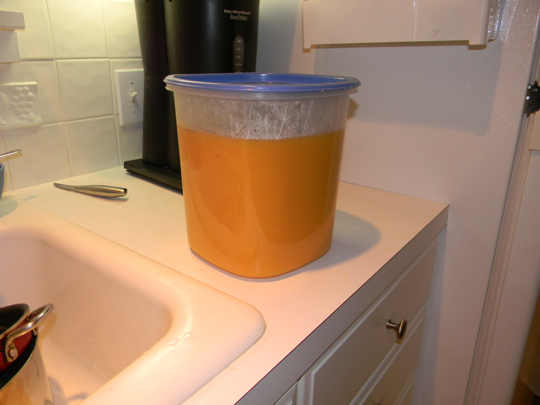 So: after all that (2 1/2 pots’ worth), now there is this giant tub of peach puree waiting its turn in either the freezer or the dehydrator, and there is still a giant bowl of peaches for Lloyd to eat. I can’t tell if the 20 bucks was a bargain or not. 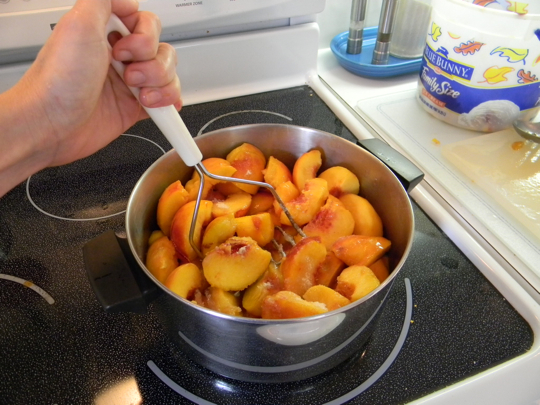 Just last night I was talking with my Aunt Bev, and she said she recently bought a box of peaches and turned them all into pie filling. She puts the filling in a freezer bag and rests it in a pie tin to freeze, then stacks the frozen pie pucks in the freezer. 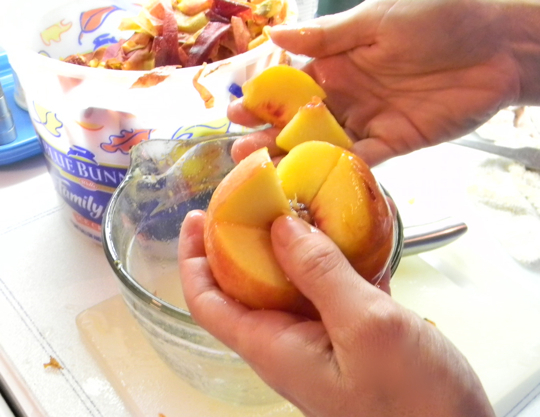 When she wants peach pie, she buys or prepares a crust, drops in a pie puck, and bakes. Oh dear. Now Lauren is going to have to get another box of peaches to test out that geniusness. Because, really, that is genius. I got a box of those peaches, too. 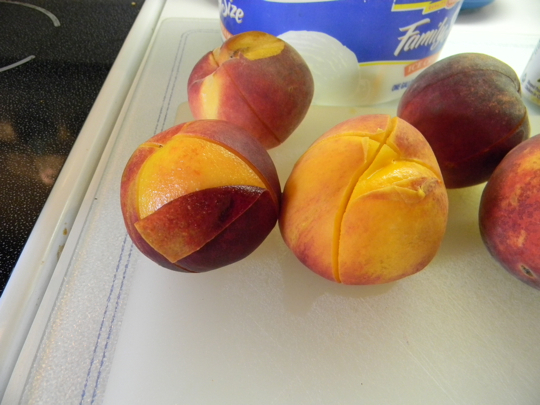 Word around town is that you can freeze peaches whole. Whole, I say. So I froze twenty of mine whole. We’ll see how that turns out. Brad -- full points for saying ‘peach puck’. That happened to me with grapes once. 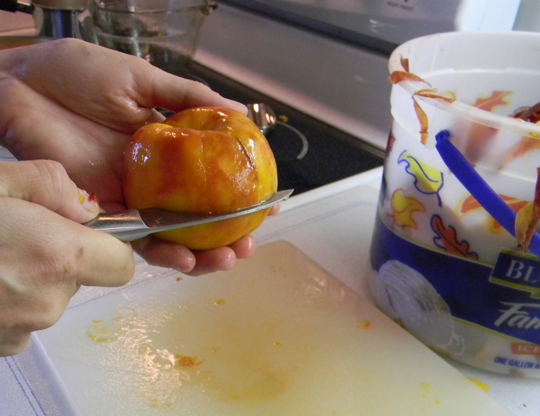 How about tiny peach pie in a jar? 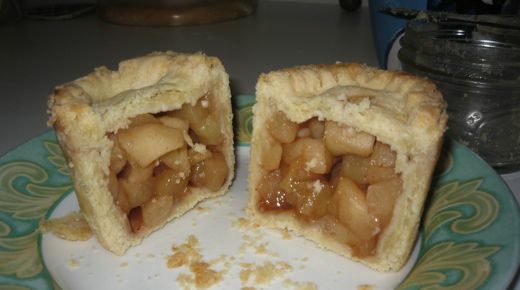 My peach pies are always soggy. I think you should have just called Kristi. She is a canning master according to recent posts on her blog. I called Kristi once in a canning emergency. She didn’t come. Sorry I have been remiss in posting for a very long time. I just want to add my two cents here. Where I live, we get a shipment of things once a year right about now that are hard and round, and never ever get ripe. 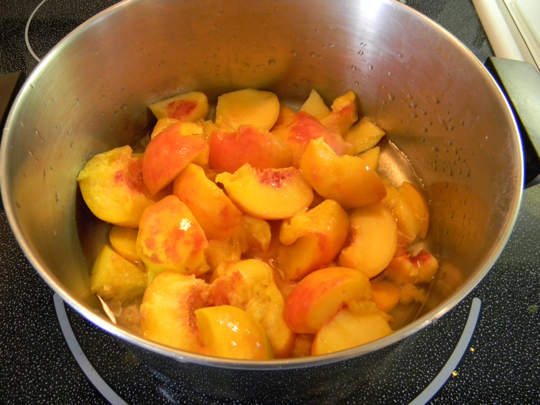 I think I would pay $100 for peaches, if they were peach-flavored and capable of yielding anything resembling what I’m seeing here.